Garlic scapes are one of nature’s little known culinary gems. In our section on Hardneck Garlics, we describe their origin. They are the flower of the garlic plant and are customarily removed in late spring to ensure the growth of larger bulbs. Scapes are magically delicious. The flavor is fresh, green, and vegetal and suffused with the taste of young, fresh garlic. The texture is tender yet crisp. They can be used as a garnish, in soups, meats and salads when simply chopped raw. They keep well in the refrigerator for up to a month: place them in a paper bag and close the top to keep them from drying out. Be sure to wash the scapes before using. For year-round usage, we have developed salt fermented scapes. For culinary ideas, please see our Recipes. Fresh scapes are available May through June with limited availability. 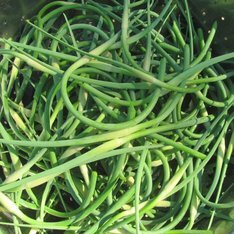 Garlic scapes have a mild garlic flavor and can be used as a garnish, in soups, meats and salads when simply chopped raw. The scapes keep well in the refrigerator for up to a month. Just put them into a paper bag and close the top to keep them from drying out. Wash the scapes before using. For year round ease of usage, our salt fermented scapes are ideal for sauces, salad dressings, meats and vegetarian dishes. 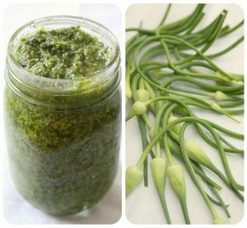 The scapes have been taken straight from the garden, finely chopped and placed in sealed glass containers with pure sea salt. No additives or other ingredients. We are currently taking orders for the FALL 2018 Planting.